A visit of this retro Museum of trade in Bratislava is also a great chance to buy some authentic Slovak gifts to take home with you! In Bratislava’s historical center, on Biela Street, only a few meters away from Františkanske namestie, you can find a special little museum with a shop called Obchod v Muzeu, that will take you back in the early 20thcentury with a genuine and authentic retro atmosphere created with furnishing, decoration and music. This authentic shop is an interesting project made recently in cooperation with the Museum of Trade. 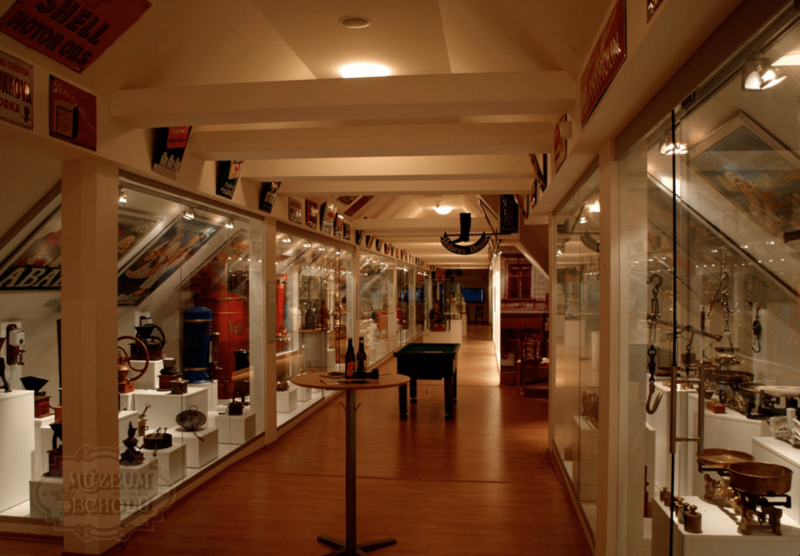 You can walk through a Museum of trade and explore a room full of historical cash machines, coffee machines, and other retail shop equipment such as weights, scales, old jars, advertising signs, containers for baking ingredients, traditional Slovak spirits etc. The first room is the actual souvenir shop where you can buy some authentic Slovakian retro gifts and folk artistic products, such as hand made bells, wicker dolls, painted eggs, locally made ceramics, postcards of Bratislava, bottles of wine and pure fruit spirits, etc. And once you are in the museum it is a must for you to try original local pastry – Bratislava rolls – with a nut or poppy seed filling – it will take your breath away. After spending some time in this retro hub of Bratislava, you can visit another museum – the Museum of Arthur Fleischmann, just next door. Fleischmann is a big name among the Slovak artist, a famous sculptor born in Bratislava.